Populist alliances and the fear of voter manipulation are casting long shadows on the next European elections in May 2019. EU officials are afraid that European democracy might get hijacked from within and without. Not only have allegations around Russian interference in American and British elections increased the salience of fake news and their impact. The unresolved question of distributing migrants has turned EU member states against each other, fuelling populism and discontent. Both may shape voting behaviour in the elections to the European Parliament next May. The external threat entered the EU in the person of Steve Bannon, former adviser to President Trump. His plan to set up a non-profit foundation called “The Movement” in Brussels through which to support anti-EU parties over the coming months has caused concern over the use of big data in targeting voters and triggering nationalist or anti-immigration sentiments. A similar strategy is believed to have given Trump’s presidential campaign a considerable boost back in 2016. As if that threat was not enough, internal cooperation between member states has recently reached another low point. The sovereign debt crisis had already highlighted the divergences between some of the EU’s 28 members, particularly Southern and Northern states. Since the arrival of migration flows in 2015 cooperation patterns have changed, but not necessarily in favour of building European cohesion. A new bloc of populist governments, spearheaded by Hungary and Italy and supported by Austria’s junior coalition partner, has provoked an open conflict with the European Commission and other member states. 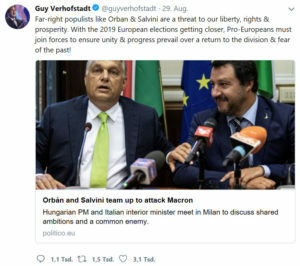 Ahead of the forthcoming elections, the governments in Budapest and Rome are preparing to push the anti-immigration agenda, even though the governing parties belong to different factions in the European Parliament. While one of the principal documents of the EU, the Treaty on European Union, upholds “common values” of democracy and solidarity in Article 2, the right-wing alliance has its own understanding of these terms: returning democratic decision-making power to the national level, and calling for greater solidarity from everyone else when it comes to hosting immigrants. The populist axis has sparked some reaction in the pro-European camp, above all by the MEP Guy Verhofstadt who called upon moderates to “join forces” and counterbalance the right-wing pressures. In France, President Macron has made it clear that he will not give in to the demands of Orbán and Salvini. From a liberal point of view, his announcement is the only right thing to do. However, the political and rhetoric rifts between the two intra-European blocs are yet to be bridged. The EU remains a fragmented community, prone to populism and nationalism. If there is one positive aspect to these troubles, it might be an increase in voter turnout at the upcoming elections. For a long time, weak participation has undermined the Parliament’s claim to be truly representative of the people, although being the only popularly elected body in the EU framework. After record lows in participation – it has never surpassed 50% since the late 1990s – the polarization of the public and the growing realization that the vote does have an impact on European society and politics might push people to the polling stations. If turnout increases, the Parliament’s legitimacy would benefit. Until then the preceding election campaign promises to be the most heated in Europe’s recent history. Studies Economic History and International Relations. Likes to think of himself as critical social scientist. Uses his free time to read Piketty and Stiglitz. Tweets @mgkriz.